The type of hardware you purchase is determined by the style of your window coverings; for instance, heavier weight fabrics and longer lengths require heavier rods than lightweight sheers and laces. Many valances require either a double rod or a completely separate rod. Curtain and drapery rods should be at least as wide as your final measured width. If your rod has decorative finials on the ends, the finials should extend beyond the final measured width so they will be visible. Refer to your worksheet for the correct measurements. Using a metal tape measure, repeat all measurements and make a small pencil mark on the wall indicating the correct width and length. Hold the rod up to the wall using the pencil marks as a guide. Position the mounting brackets on the rod, and use a pencil to mark where the brackets will be screwed into the wall. Be sure that the rod is centered on the window. Use a 3/32-inch drill bit if the screws will be installed in wall studs; use a ¼-inch drill bit if the screws will be installed into drywall. If you are installing the screws in drywall, you should use the plastic anchors provided with the curtain rod. Once you have drilled the hole in the drywall, insert the plastic anchors all the way into the hole. The screws will then screw into the plastic anchors. Align the screw holes on the mounting brackets with the holes you drilled in the wall. Use a standard screwdriver and screw in the bracket screws. Before you tighten the screws completely, check and make sure that the rod fits correctly into the brackets; then tighten. 1. For stationary window treatments, you can simply slide the standard rod or decorative pole through the rod pocket of the window treatment. You may want to place a plastic bag over the end of the rod or pole, so the fabric does not snag. Adjust the rod to the correct width and slide the rod onto the mounting brackets. Adjust the fabric so that the panels fall in even folds, and secure the sides with tiebacks or holdbacks, if desired. If you are using clip rings, put the rings on the rod first, then adjust the rod to the appropriate width and slide the rod onto the mounting brackets. Clip the rings to the window treatments, making sure to space the fabric evenly. 2. 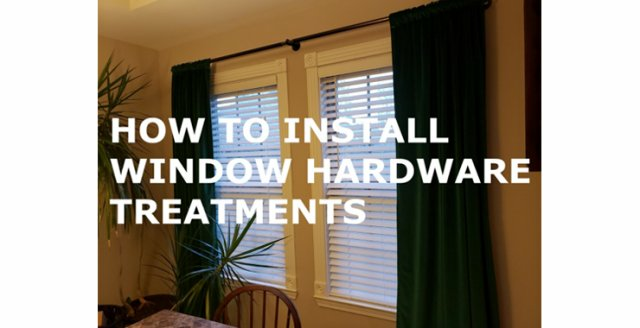 To hang moveable window treatments, you will probably use a traverse rod with either hooks or clip rings. If you are using hooks, slide the pointed end of the hook up through the back of the fabric; making sure that the hook stays on the inside of the fabric and does not show in the front. Use one hook for each pleat, or equally space the hooks across the fabric. The hooks should all be the same distance from the top of the fabric—low enough that the fabric covers the traverse rod. Once all of the hooks are in place, place the traverse rod in the “closed” position, so that the plastic grommets in the rod are evenly spaced across the window. Start from one end and place the first and second hooks into the fixed end of the traverse rod. Continue to place the hooks in grommets until all of the hooks are attached.